A poet once wrote that it is the journey, not the arrival that matters; he might well have had the White Mountains in mind. Choose any route and just head up the road. Each one has its special rewards – scenes of pastureland and forest, charming New England villages, and wide open panoramic mountain views. Only here would the drive along I-93, afford some of the best views to be had. 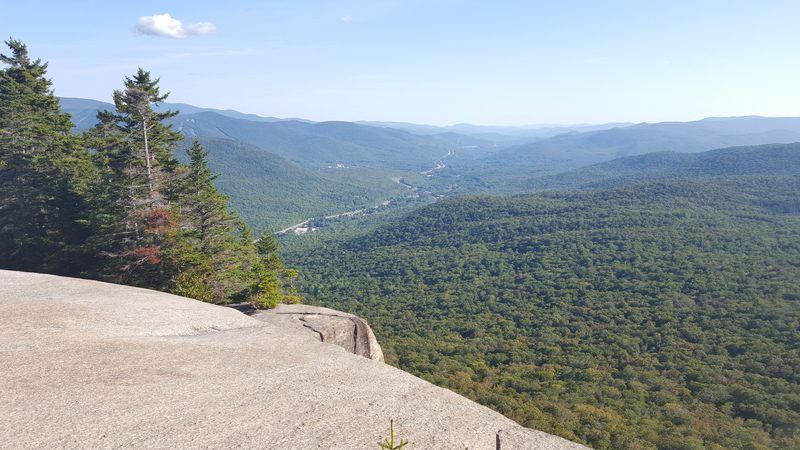 From Woodstock north on I-93 to where the highway becomes the Franconia Notch Parkway (in Lincoln), this stretch of road is amazingly scenic, affording spectacular views of long vistas. The parkway takes you through Franconia Notch State Park, and between the towering peaks of the Franconia and Kinsman mountain ranges. Crossing the flank of Mt. Kancamagus, this National Scenic Byway climbs to nearly 3,000 feet. There are numerous scenic outlooks and scenic areas, so plan to stop along the way. The scenic areas, which have been designated by the Forest Service to preserve their outstanding and unique beauty, include the Rocky Gorge Scenic Area, right off the highway; Sawyer Pond, and Greeley Ponds Scenic Areas, a half day’s hike over Forest trails. Please note there are no gas stations or other services along this route. While the Kancamagus ends in Lincoln, Rt. 112 continues through North Woodstock and Kinsman Notch, and Easton, as well as the Connecticut River Valley. A beautiful route off the beaten path. Truly a “shunpike”, Rt. 175 is well worth the drive. Rt. 3 parallels the more frequently traveled I-93. This route climbs steeply through beautiful woodlands and offers a sweeping view near the height-of-land. This ride takes you through Easton where you can reverse direction and head to Sugar Hill. Don’t miss Sunset Hill Road; while short, it affords spectacular views, and the Lupines that bloom the first two weeks of June. Located on White Mt. Central R.R. at Clark’s Trading Post, this 120 ft. long bridge is the only Howe truss railroad bridge left in the world. Built in 1904, it spans the Pemigewasset River. Built in 1939, this 60 ft. 5 in. footbridge spans the Pemigewasset River at The Pool in Franconia Notch State Park. It is named for a tall pine that once stood near the pool; the pine fell from the 1938 hurricane, and the bridge was built atop it. This c. 1886, 50-foot long bridge spans the Pemigewasset River in Franconia Notch State Park. Of paddleford truss construction, it has a hikers’ walkway on its northern side. Moose sightings are quite common in Mountain Country. Most common sightings are along Route 118; on the Kancamagus Scenic Byway especially near the Passaconaway Campground; and around Crawford Notch. Moose are often on the move at dawn and dusk, especially in low lying or swampy areas. If you see one – brake! If you want to watch them, pull safely over to the side of the road (watching for other cars), and stay in your car! Best bet: take a moose and wildlife tour with Pemi Valley Excursions, they’ll take you on a scenic tour of the best moose watching areas in the White Mountains. Remember, these animals are wild and can move quickly and unpredictably. Also, by staying in your car, you will be less likely to disturb the moose, and will more likely enjoy a longer period to view this majestic beast.